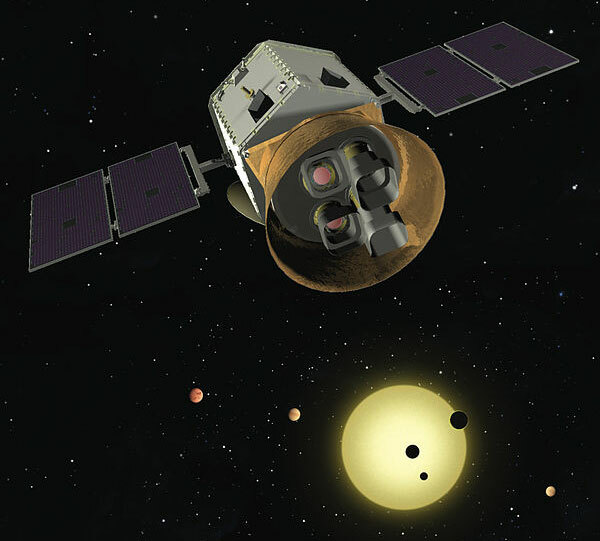 Scientists at the Harvard-Smithsonian Center for Astrophysics (CfA) are among those drafting the target list for NASA’s next planet-finding telescope, the orbiting Transiting Exoplanet Survey Satellite, or TESS, which will search the Earth’s galactic neighborhood for planets that might support life. TESS cleared a major hurdle in April, gaining NASA approval for final design and implementation. Pending a series of reviews, TESS is expected to launch sometime in early 2018 and focus on Earth’s stellar neighbors, 500,000 of the nearest and brightest stars. Their proximity will raise the chances for follow-up observations of systems that show the telltale dimming in starlight that indicates a planet is crossing the star’s face. Harvard-Smithsonian astronomer David Latham, the project’s science director, said the CfA’s work eventually will involve as many as 36 scientists, fellows, and students, as well as possibly hundreds more from around the world who will pore over data, which will be released publicly within months of being collected. “These are the nearest and best and brightest examples of transiting planets we’ll ever have, at least from the Earth,” Latham said. The Center for Astrophysics is one of several partners on the project. The effort’s principal investigator is George Ricker of the Massachusetts Institute of Technology, and his colleagues there will play a leading role in designing and building the instruments. Other key partners include NASA, which will manage the project and provide the launch vehicle, as well as the private contractors Orbital Sciences Corp., and Space Telescope Science Institute. The spotlight on TESS grew brighter in recent months after a balky wheel caused a malfunction aboard the Kepler space telescope, a hugely successful orbiting telescope launched in 2009 that was dedicated to finding planets around other stars. Kepler identified hundreds of such extrasolar planets, or exoplanets, as well as thousands of planet candidates. Though Kepler has stopped gathering data, confirming the planet candidates will take astronomers years to work through. Some scientists consider TESS a natural follow-up to Kepler, whose mission was to focus on a small, distant patch of sky to determine just how numerous extrasolar planets are in the Milky Way. Now that Kepler has shown that such small planets are common, TESS will conduct an all-sky survey of the nearest, brightest stars to identify those close to Earth, with an emphasis on small, rocky planets that might harbor life. Such planets are difficult to detect because of their small size, compared with the gas giants, such as Jupiter, whose transit across a star’s face blocks much more of the light generated. Scientist believe that life is likelier to be found on rocky planets like Earth as well as larger, rocky “super Earths,” ranging up to two times the size of this world. To harbor life, such a planet would have to be orbiting in its star’s habitable zone, close enough to its star that water on its surface would be liquid but not so close that the star’s heat would boil the water off into space. Latham said he and Ricker have been working on the idea for TESS for more than seven years and had proposed two earlier versions. He said the failure of those projects may ultimately have been a good thing, since the approved TESS has the benefit of recent technological advances and new knowledge about exoplanets, as well as a larger budget — $200 million — that comes via NASA’s Explorer program. The satellite will work its way around the sky using four cameras to stare at successive fields of view for a month each. The craft will follow an unusual orbit that will take it close to the Earth and out to the moon’s orbit every 13.7 days. It will spend the first year of the two-year mission scanning the northern sky, then change orientation and for the second year scan the southern sky. The result, Latham said, should be many candidate planets that require follow-up through other instruments. The planned James Webb Space Telescope, which may launch as soon as 2018, will conduct some of that work, as will ground-based facilities such as the Giant Magellan Telescope being developed for a mountaintop in Chile and two HARPS instruments — it stands for High Accuracy Radial velocity Planet Searcher — one each in the northern and southern hemispheres. For the likeliest candidates, follow-up will include atmospheric analysis using spectrographs. Scientists can analyze the starlight passing through a planet’s atmosphere and, because different molecules absorb different wavelengths of light, determine major atmospheric constituents. Chemicals that result from biological activity on Earth, such as methane and oxygen, should create an atmospheric signature that provides evidence of life on that planet.